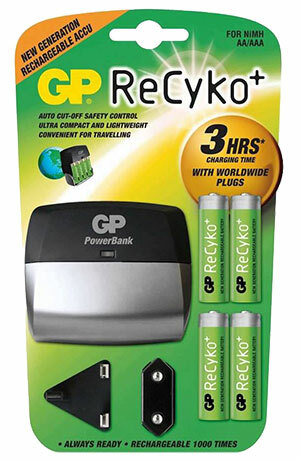 Today, we are looking at a GP ReCyko+ PowerBank M540 Battery Charger. The charger in question is a 3 hour universal travel charger which comes supplied with not only multiple detachable plugs for use in different countries, but also 4 x 2100mAh AA pre-charged batteries. Here at Cell Pack Solutions, we are big on safety and are glad to say that the ReCyko+ charger comes with built in overcharge protection to ensure the safety of your batteries while you are away doing day to day activities. This not only puts you at peace of mind but makes sure that you don’t take the batteries off charge before they are fully charged too! Although this charger comes supplied with 4 x AA cells, it can also charge your AAA cells and you can look at our ReCyko Range if you would wish to purchase them with a charger such as this one. As the name suggests, this charger is capable of charging up to four AA/AAA batteries in just 3 hours! Please be aware however, that this time is just a guide and may vary with different capacity batteries to that of the ones supplied with this product. Weighing in at just 308g, we believe this charger to be a great deal if you are thinking of going away abroad or even somewhere here in the UK due to its incredibly small size yet it’s amazing charging potential, making it a must have for any traveller. Right now at Cell Pack Solutions we are selling this gem at only £17.92 inc VAT, but stocks are limited so grab your travel charger while you can!